Will LeBron Still be a Top-10 Player in Five Years? Will 39-year-old LeBron James still be dominant in the year 2023? The Open Floor podcast crew predicts his future and discusses why LeBron James Jr. might be his motivation to play late into his career. In the latest Open Floor podcast, Andrew Sharp and Ben Golliver take a look into the future and debate who will be the 10 best players in the NBA five years from now. The nominees include: Anthony Davis, Giannis Antetokounmpo, Kevin Durant (if he’s not retired), Joel Embiid (if he’s healthy), Karl-Anthony Towns, Kyrie Irving, Ben Simmons, Devin Booker, Donovan Mitchell, Jayson Tatum and more. The biggest question of all, however, might be the status of LeBron James at the age of 39. Will he remain the dominant force that he has been the past 15 years or will he fizzle out? Sharp and Golliver give their takes on the King and why LeBron James Jr. might be his biggest motivation for him to play past 2023. Ben Golliver: I am out on LeBron [at 39 years old]. Andrew Sharp: Are you really? That was going to be my final question. Because 39-year-old LeBron—I don’t know if I am completely out. He probably won’t be a top–five player. Golliver: You are just trying to make headlines right now, Andrew. Come on. Sharp: (Laughs) Look, Kobe was still kicking at 39 and LeBron‘s game is going to be a better fit. Sharp: Let’s look at when Kobe retired, I think he was. Golliver: No, he definitely was not. He wasn’t kicking, whatever he was doing on the court. He might have been bricking but he wasn’t kicking at 39. Sharp: (Laughs) He was definitely bricking. But yes, you're right, Kobe’s final season he was 37, so 39 might be asking for a lot. But this is the most outrageous athlete we might have seen in the last 50 years in American sports; all bets are off when it comes to LeBron and his million dollar-training regimen. I can see him out there because if nothing else, we know he wants to play with his son. Golliver: I think there is a chance that LeBron will still be a top-25 player five years from now, I am not willing to go to top-10 but that’s what I was going to ask you because you brought up the Jr.’s, the III’s and the IV’s. Here is a better question for you: Over the course of 50 years, what is the over/under of seasons that LeBron James Jr. is considered a top–10 player in the NBA? I want to set the over/under at 2.5. What do you take—over or under? Sharp: I am going to go under. Sharp: LeBron Jr. is going to have a lot to work through. This is peak offseason content here. We can get into Zaire and Zion Wade, Kiyan Anthony and Chris Paul’s kid. Let’s dive into the next generation of the banana boat. Golliver: Andrew you are showing no respect to LeBron James Jr.’s National Championship in AAU that his team just won. Sharp: That’s the headline (laughs)—LeBron James Jr. already overrated. Golliver: I am going over. I think he is going to do it. I have complete faith. LeBron if nothing else, once he gets tired of perfectly manicuring situations for himself, won’t he perfectly manicure situations for his son—whether he is a GM or an owner, maybe a player-coach, whatever LeBron can do to put his son in position to get stats and chase rings in the NBA, I believe LeBron will be able to do it. That is why I am going over. 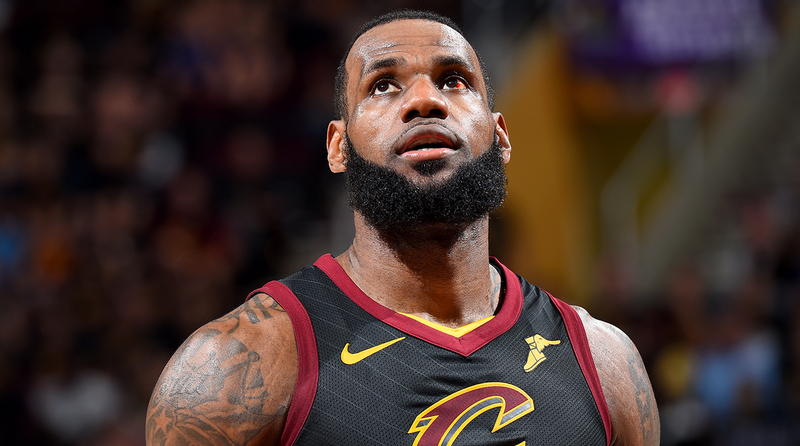 Sharp: That might be the best reason of all to doubt this, because if we are talking about LeBron’s ability to manicure his own situations his track record isn’t great. The last couple of years in Cleveland, whatever the hell is going on in L.A. this summer, I am sure we can touch on later in the podcast, maybe LeBron is trying to mastermind things for his son and I don’t know if that is a good thing for LeBron Jr.
Golliver: I hear you that he might not be the best at collecting rings and his talent eye is not perfect by any stretch but he has been the No. 1 ranked guy on SI’s Top 100 every single year that I have done it. If we are talking about positioning for maximum credit and valor and hero worship, LeBron has that mastered. I can see that skill and that ability to put his son in the ring—like his favorite Roosevelt quote that he uses “The Man in the Arena”, he is going to have LeBron Jr. as the man of the arena no doubt about it. For that reason I am going over on my own line that I just made up.